This minimalist Screen is 1200mm wide and has a 1000mm bracing arm. Glass panel adjustment 1155mm - 1180mm. Bracing arm adjustment range 960mm - 1010mm. Please state hand of Glass when ordering. Right Hand glass shown in main photo. 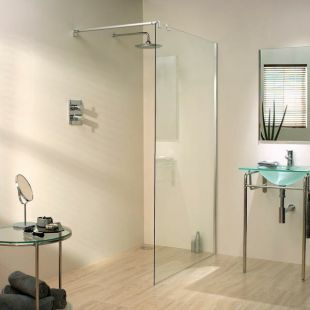 This door is available as a Bespoke Shower Door, (custom made) to suit special height and width requirements.